You’ve probably heard the phrase, “You can’t pour from an empty cup.” Common-sense, right? But it often seems we try to do just that. I hope you understand this Dear Mom: you need to fill up if you are going to pour into your children day after day. To care for your kids, you have to make self-care a priority too. When you drain the liquid out of a cup, you empty it, leaving it dry. Empty—nothing left, nothing to draw from. Dry—parched, thirsty, in need of hydration. But there is hope! Filling your cup doesn’t have to be difficult or take a lot of time. It does take intentionality, though. 1. Choose a way to homeschool that works for both your kids and you. There is so much freedom in homeschooling, and yet we tend to forget to enjoy it. Of course different states have different laws regarding the time you must spend homeschooling, what subjects you should cover, and whether you have to be evaluated in some way. But even then you choose the “how” of homeschooling. Of course there are times you’ll choose to do something you don’t particularly enjoy like my friend Jen does when it comes to reading aloud, and Emily who incorporates nature study even though she isn’t the outdoorsy type. But if homeschooling exhausts you each day because of how you are doing it, you need to rethink your overall plan! And that doesn’t mean you have to throw it all out. Simply be ready to adapt as needed. 2. Set realistic expectations for life beyond homeschooling. As a homeschooling mom, there is more to your day than educating your children in the academic subjects. We need to shift our mindset sometimes. Homeschooling is life-schooling. And so as a family we need to work together with a team mentality. We have to remember our homes do not have to be perfect. Give yourself some grace. Of course there are some standards of cleanliness…let’s face it we do need clean clothes and dishes! But your home does not have to look like the HGTV Design Home. Learning is often messy. Life is messy. So I’ll say it again: give yourself grace when it comes to taking care of your home. Maybe you need to talk to your husband and kids about what you all expect and can live with. Have a team meeting to discuss these things and then make a plan. And take heart—when you focus on getting some housework done you aren’t skipping school. Learning to take care of the home is an important lesson each of your children needs to know as well as math, writing, and science. 3. Put your blinders on. Blinders are “a pair of small leather screens attached to a horse’s bridle to prevent it seeing sideways and behind.” Y’all we could use a pair of those. How often do we stray from our path, from the race we are running because we start looking around us? Theodore Roosevelt once said, “Comparison is the thief of joy.” And that is true. But it is also the thief of time, money, and sanity as you try to duplicate someone else’s life. When we compare we either puff ourselves up with pride believing we are doing it better (and then we tend to be humbled in some way), or we end up feeling depressed believing we are not doing enough when it comes to this homeschooling thing. So ask yourself and your family, “Why are we homeschooling?” Then stay true to your reasons for doing it. By knowing your why, you can evaluate each opportunity in light of it and your family’s priorities. It will help you say no to the good so you have time for the best. 4. Cultivate an atmosphere of thankfulness. Complaining looks at what we don’t have instead of what we do have. It is a negative response instead of a positive outlook. Complaining says “This isn’t good enough. You aren’t good enough.” Complaining leads to discontent. Now that sound draining. Keep a family gratitude journal and have each member record something they are thankful for each morning. When you are about to complain, think about something you are thankful for in the same situation. For example, if you begin to complain about all the laundry, stop and say thank you for the fact that you have clothes to wear and for the people who wear them. Model gratitude to your children. Say “thank you” to them for the things they do for you or around the house. Let them hear you say it to those you encounter in life such as people who check out your groceries or wait staff in restaurants. 5. Deal with conflict when it comes up. Unresolved conflict and the hurt that often accompanies it leads to bitterness. And nothing will eat at you more than having a root of bitterness in your soul. 1. Deal with conflict in a timely manner. 2. Do what you can to resolve the conflict, but know you can’t control others. We have a choice about our actions when it comes to conflict, and that is our responsibility. Sometimes we need to ask for forgiveness, and sometimes we have to forgive. And often the situation requires both. 3. Remember that forgiving others doesn’t mean you have to put yourself in the same situation again. Forgiving others doesn’t mean we never remember the offense, or that we even trust the other person again. It is about letting go. Letting go of our need for revenge and trusting God in the situation. It’s not holding on to our perceived right to “justice” but instead recognizing the Just One. Community is important; we are designed for it. When we homeschooled we were a part of a small co-op that met for twelve years. Through it we supported one another, encouraged one another, and loved one another. We also learned to deal with conflict and how to work with each other despite our differences. At times it brought us face-to-face with our own selfishness and sin. But we also laughed a lot, did things we wouldn’t have done alone, and walked through the homeschooling journey together. We had to choose to believe the best about one another. Choose to trust their hearts. You may have to be creative, and you may have to step out of your comfort zone. But find your own community whether through a co-op, your church, or even through community service. We really are better together. How will we ever reach the hearts of our children if we neglect our own? Grafting is a gardening term where a smaller stem of one plant is inserted and fixed to the stock of another plant selected for its strong roots. Homeschooling is hard work. It requires patience, intentionality, humility, love, and a good sense of humor. There are simply times we want to quit. But God is there to strengthen you. You may feel you don’t have time, but it is essential to make time for your relationship with God. And you can download a FREE 25 page devotional study and journal: Who I Am in Christ: A Scripture Writing and Prayer Journal. This may be the one thing we neglect the most as homeschooling moms. We always think we will do it later. But the cornerstones of health—eating well, exercising, and getting enough rest—are essential to keeping your cup full. It doesn’t need to be complicated to be effective. Whether it is playing with your kids at a park, taking a nature walk, or investing in an exercise video and doing it (I like Leslie Samson’s at home walking videos), incorporating movement each day or some form of exercise three times a week can really make a big difference. You may have to get creative, and it will look different in the various seasons of your life. But you need rest. Though you may find it difficult, there is a lot of wisdom in setting aside one day a week to rest. 9. Incorporate things you enjoy doing into your daily or weekly routine. I love to read, so each day as my children did their daily individual reading, I grabbed a book and read too. Could I have used that time to pick up the house or do some laundry? Yes. But I chose to make something I enjoyed a priority during the day. We would sit in the same room, each snuggled in our own blankets, and read. There was value in my kids seeing that, and there was value for me personally. I call that a win/win situation! 10. Continue to learn and grow. One of the joys of homeschooling is learning alongside of our children. And when we chose to learn something new, we are modeling an important lesson: the idea of life-long learning. So take the time to take an online course, figure out how to do something you’ve always wanted to do, give yourself permission to take time for your interests. And believe it or not, instead of being selfish in pursuing some of your own interests, you are actually helping your children as they see you learning and enjoying life. Burnout, irritability, frustrations, exhaustion—you’ve probably experienced at least one of these. And if you haven’t there is a good chance you will at some point in your homeschooling journey. That is why self-care must be a priority. 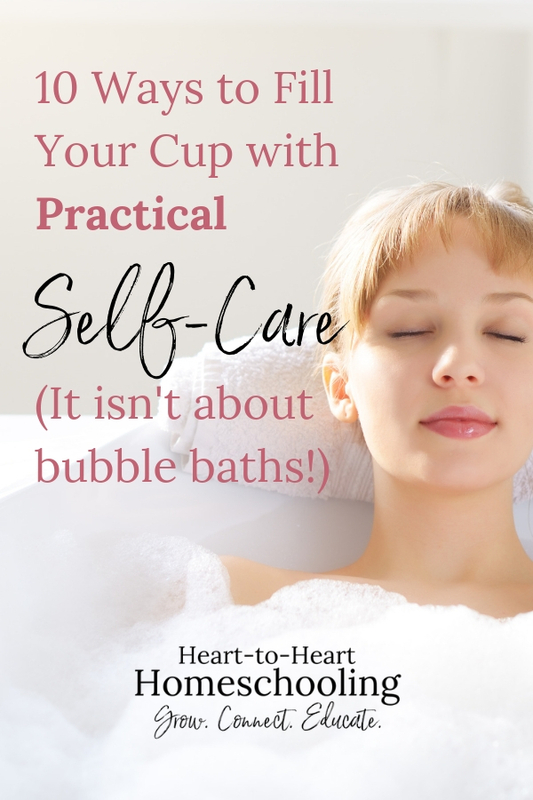 Unfortunately, we often seem to associate self-care with selfishness. But that is simply not true. It is one of the most loving things you can do for your family. #9 is my favorite…well, #9 AND #11!